What kind of paper or board to use for a show? Reader Question: I am very interested in pen and ink drawing these days, and hope to produce enough drawings to show at my local coffee shop. However, as a self-taught artist, I'm not sure what kind of paper or board to use for my drawings. I would like them to look nice when they hang in the shop, but also to be sturdy enough for potential buyers to hang in their house. Is it best to draw on paper and frame the work, or to draw on a board (framed or not)? The most important factor in choosing a paper or board to draw on is that it needs to last a long time. The best way to ensure the longevity of your work is to use paper that is archival. If the paper is not archival, then the paper will yellow and stain with age and may even lighten your work or alter its appearance in some other way. If you use archival paper or board, this will not happen, and your artwork will live a long, happy life. Archival papers and boards will always be labeled or advertised as such, so check the packaging before you buy to make sure it says "archival". Please note that some papers and boards are labeled "acid-free", but this is not the same as archival. 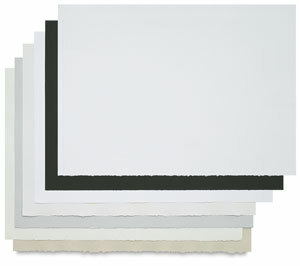 Acid-free papers have been buffered to an acid-free state, but the acids will return over time, causing the paper to deteriorate and yellow. The only way to assure a truly acid-free surface is to buy archival paper and then frame the artwork using archival materials. You can also look for papers that are made from 100% cotton. Even if it is not labeled as "archival", paper that is made from 100% cotton will last for at least 100 years or more before fading or deteriorating. As for the weight of the paper, (which is related to the sturdiness of the paper), this is a matter of personal choice. As long as the final drawing is securely mounted onto a mounting board, which is then matted and framed, then even a thin sheet of paper should stay secure for display. If I'm creating a pen and ink drawing to sell, I like to work on paper that is really sturdy (that is, heavy and thick), so that the paper won't bend, warp or crinkle. My favorite paper for pen and ink is the 300lb hot-pressed paper from Fabriano (this links to Blick Art Materials, and if you make a purchase I get a small commission that helps support this site). This archival paper has a smooth surface and it's really thick and sturdy, so I feel confident that it won't bend or crinkle at any stage of the drawing, framing or displaying process. 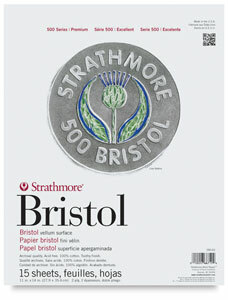 The Strathmore 500 Series Bristol Board is a 100% cotton fiber, acid-free Bristol board. 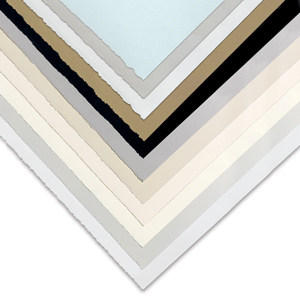 The Canson Bristol Plate Art Board is an acid-free paper that is mounted onto a rigid, archival backing board, which means it can be framed without mounting. If you are using top-quality drawing paper or board, then you will want to display your pen and ink art using archival materials also. You should use archival-quality mat boards and mounting boards that are made from 100% cotton fiber, as well as archival tape, and then frame your work behind glass or Plexiglass for the best protection.